​The federal bankruptcy laws were enacted to provide good, honest, hard-working debtors with a fresh start and to establish a ranking and equity among all the creditors clamoring for the debtor's limited resources. Bankruptcy helps people avoid the kind of permanent discouragement that can prevent them from ever re-­establishing themselves as hard-working members of society. 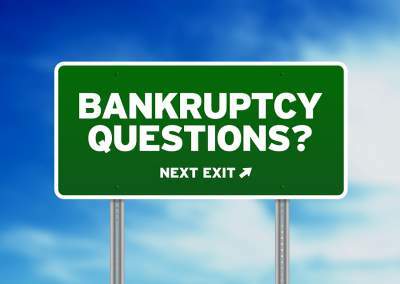 This discussion is intended only as a brief overview of the types of bankruptcy filings and of what a bankruptcy filing can and cannot do. No one should base their decision as to whether or not to file bankruptcy solely on this information. Bankruptcy law is complex, and there are many considerations that must be taken into account in making the determination whether or not to file. The Bankruptcy Code is divided into chapters. The chapters which almost always apply to consumer debtors are chapter 7, known as a "straight bankruptcy", and chapter 13, which involves an affordable plan of repayment. ​In a chapter 7 case, the bankruptcy court appoints a trustee to examine the debtor's assets to determine if there are any assets not protected by available "exemptions". Exemptions are laws that allow a debtor to keep, and not part with, certain types and amounts of money and property. For example, exemption laws allow a debtor to protect a certain amount of equity in the debtor's residence, motor vehicle, household goods, life insurance, health aids, retirement plans, specified future earnings such as social security benefits, child support, and alimony, and certain other types of personal property. If there is any non-exempt property, it is the Trustee's job to sell it and to distribute the proceeds among the unsecured creditors. Although a liquidation case can rarely help with secured debt (the secured creditor still has the right to repossess the collateral if the debtor falls behind in the monthly payments), the debtor will be discharged from the legal obligation to pay unsecured debts such as credit card debts, medical bills and utility arrearages. However, certain types of unsecured debt are allowed special treatment and cannot be discharged. These include some student loans, alimony, child support, criminal fines, and some taxes. In addition to attorney fees, there is a filing fee of $306 ($335 effective June 1, 2014) that must be paid to the Bankruptcy Court. ​In a chapter 13 case, the debtor puts forward a plan, following the rules set forth in the bankruptcy laws, to repay certain creditors over a period of time, usually from future income. A chapter 13 case may be advantageous in that the debtor is allowed to get caught up on mortgages or car loans without the threat of foreclosure or repossesion, and is allowed to keep both exempt and nonexempt property. The debtor's plan is a document outlining to the bankruptcy court how the debtor proposes to dispose of the claims of the debtor's creditors. The debtor's property is protected from seizure from creditors, including mortgage and other lien holders, as long as the proposed payments are made and necessary insurance coverages remain in place. The plan generally requires monthly payments to the bankruptcy trustee over a period of three to five years. Arrangements can be made to have these payments made automatically through payroll deductions. In addition to attorney fees, there is a filing fee of $281 ($310 effective June 1, 2014) that must be paid to the Bankruptcy Court. ​By and large, chapter 11 is a type of bankruptcy reserved for large corporate reorganizations. Chapter 11 shares many of the qualities of a chapter 13, but tends to involve much more complexity on a much larger scale. However, since chapter 11 does not usually pertain to individuals whose debts are primarily consumer debts, further information about chapter 11 will be provided by reference to the following resource: The "Bankruptcy Basics" brochure prepared by the Administrative Office of the United States Courts, dated June 2000, and which can be accessed over the internet by visiting the following website: www.uscourts.gov/bankruptcvcourts.html. However, as with chapter 11, since chapter 12 does not usually pertain to individuals whose debts are primarily consumer debts, further information about chapter 12 will be provided by reference to the same "Bankruptcy Basics" brochure referred to above, which can be accessed over the internet at the same said website as mentioned for chapter 11. Discharge liability for most or all of their debts and get a fresh start. When the debt is discharged, the debtor has no further obligation to pay the debt. Protect all cosigners on their debts. If relative or friend co-signed a loan which the debtor discharged in bankruptcy, the cosigner may still be obligated to repay whatever part of the loan not paid during the pendency of the bankruptcy case. By federal law, a bankruptcy can remain part of a debtor's credit history for 10 years. Whether or not the debtor will be granted credit in the future is unpredictable, and probably depends more on what good things the debtor does in the nature of keeping a job, saving money, making timely payments on secured debts, etc., than the fact that the debtor filed bankruptcy. In some cases it may actually be easier to obtain future credit after bankruptcy, because new creditors may feel that since the old obligations have been discharged, they will be first in line. They also recognize that the debtor cannot again file bankruptcy for at least the next four years in the case of chapter 13 or eight years in the case of chapter 7. The truth is that if a debtor cannot pay his or her bills, and the debtor's credit is already ruined or exhausted, filing bankruptcy can actually be an important first step in re-building credit. If, on the other hand, you meet all of those criteria, there are many non-profit credit counseling organizations that will work with you to solve your financial problems. But be aware that, just because an organization says it's "nonprofit," there's no guarantee that its services are free, affordable, or even legitimate. In fact, some credit counseling organizations charge high fees, which may be hidden, urge consumers to make "voluntary" contributions that can cause more debt, urge consumers to enter "debt repayment plans" they simply cannot afford. Most credit counselors offer services through local offices, the Internet, or on the telephone. If possible, it is probably best to find an organization that offers in-person counseling. Many universities, military bases, credit unions, housing authorities, and branches of the U.S. Cooperative Extension Service operate nonprofit credit counseling programs. Your financial institution, local consumer protection agency, and friends and family also may be good sources of information and referrals. If your financial problems stem from too much debt or your inability to repay your debts, a credit counseling agency may recommend that you enroll in what is knows as a "debt management plan" or "DMP". A DMP alone is not credit counseling, and DMP’s are not for everyone. You should sign up for one of these plans only after a certified credit counselor has spent time thoroughly reviewing your financial situation, has offered you customized advice on managing your money, and has analyzed your budget to make sure that the proposed DMP is one you can afford. However, remember that all organizations that promote DMP's fund themselves in part through kickbacks from the creditors involved, which are called "fair share", so you have to be wary as to whose best interest the counselor has in mind. Even if a DMP is not appropriate for you, a reputable credit counseling organization still can help you create a budget and teach you money management skills. Some places in the bankruptcy code require you to determine and list the replacement value of an asset, as for instance a car, or furniture. When replacement value is required, it means the replacement value, established after reasonable inquiry, as of the date of the filing of your bankruptcy case, without deduction for costs of sale or marketing. With respect to property acquired for personal, family or household purposes, replacement value means the price a retail merchant would charge for "used" property of that kind considering the age and condition of the property. Please Note: Both this Notice and the following Notice are required by legislation adopted by Congress in 2005, after intense lobbying by the credit industry. In our opinion, these notices are designed to intimidate people who need debt relief and these notices are based on the false assumption that all people are dishonest. Please rest assured. So long as you are honest and meet the requirements set out under the law, you are entitled to debt relief. We can guide you through all the requirements of filing bankruptcy, so long as you provide us accurate and complete information.